KATHMANDU, Jan 6: Nepal Stock Exchange (Nepse) benchmark index bounced back 33.25 points this week to close at 1,423.83 points on Thursday-the last trading day of the week. The rise of the benchmark index marks the end of continuous slump of stocks in the market. This is the first time the index has climbed in the last three weeks. The stock market was in a freefall after the 'left alliance' claimed victory in the recently held parliamentary and provincial polls. Investors seemed to be worried about the rise of the 'left alliance' to the government, according to analysts. Skyrocketing interest rates in the wake of shortage of lendable fund in bank and financial institutions has also sent stocks downward. Analysts, however, say that the rebound in the market is largely due to the downfall in the price of stocks. As investors felt pressure of margin call due to fall in the stock price coupled with tightening of lending due to 'credit crunch', there was a sell-off pressure in the market. Many investors, mostly those with little appetite for market risks, deposited their cash in banks that offered up to 13 percent interest rates, an investment they found more profitable than the secondary market. “Many investors want to get hold of shares whose price have fallen drastically due to heavy correction,” a broker told Republica, who wanted to be unnamed as the Securities Board of Nepal (Sebon) has restricted brokers to make comments about the market. 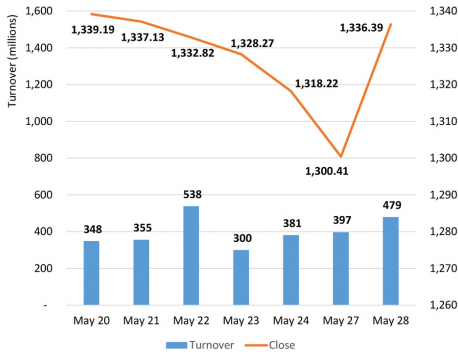 A total of 6.48 million units of shares of 179 companies worth Rs 2.71 billion were traded in the market this week through 27,583 transactions. Most of the trading groups registered gain this week. Insurance group was the highest gainer of the week as its sub-index shot up 92.91 points to close at 7,305.14 points. Microfinance group climbed up 42.81 points to close at 1,724.54 points. Banking, the heavyweight group, also ended 42.72 points higher at 1,231.91 points. Sub-indices of Hotels and Manufacturing and processing groups went up 24.02 points and 29.24 points, respectively, ending at 2,115.75 points and 2,525 points. Development Bank group also rose 16.37 points and settled at 1,595.99 points. Hydropower group and Finance group also ended in the green zone. Their sub-indices went up 9.31 points and 7.75 points, respectively, closing at 1,915.75 points and 733.02 points. While 'Others' group remained unchanged at 773.36 points, Trading group ended 1.27 points lower at 190.71 points. 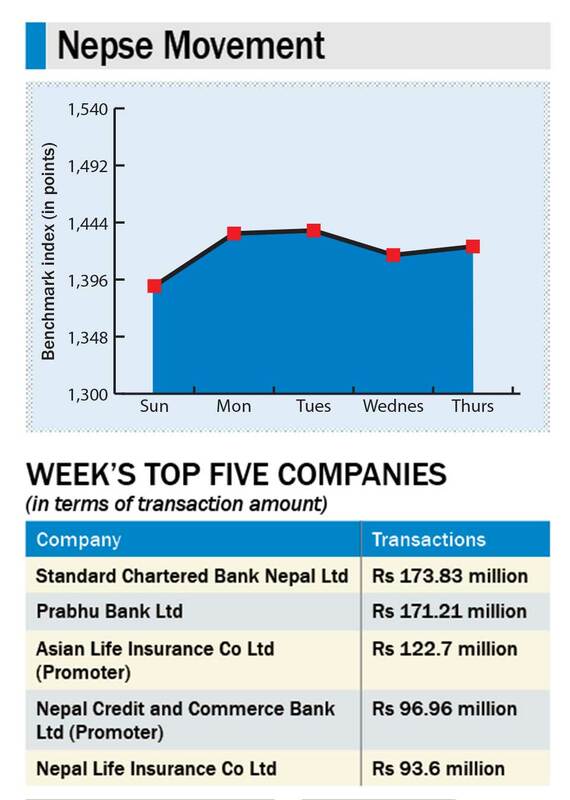 Standard Chartered Bank Nepal Ltd topped the list of companies in terms of turnover (Rs 173.8 million) and number of transactions (2,757). It was Prabhu Bank Ltd that remained at the top of list of companies in terms of traded shares (534,000 units). Rights shares of Mega Bank Nepal Ltd and bonus shares of Mero Microfinance Bittiya Santha Ltd were listed in Nepse this week for the trading. BARCELONA, Nov 25: Barcelona's next two matches will go a long way to making or breaking its Spanish league title defense.